For such a young whisky this is pretty decent, not had it for a long time and I purchased this bottle when it was about £22 some years ago. If only it was that price now. Bruichladdich from the past. Well, a few years at least. That’s when I bought a set of three miniatures, but so far I did not get round to tasting them. I’ll make time now. I will start with this Waves. Lovely fresh nose full of grasses and some earth. Farmy too. Saddle and raw broccoli. Smell quite young though. Oh, wait… it is. After a few moments it becomes sweeter on vanilla and apples, but also some watermelon and gooseberry. Hardly any spices, bar some cumin. It is immediately sweet and fruity on the palate, with a prickly pepper. Liquorice and loads of citrus reveal themselves. They are louder than the apples. A salty edge. Quite powerful despite being modest in ABV. Strangely enough, I also get a floral side with a slight metallic taste which is a bit weird – not in a good sense. The finish is short to medium long, with again some salty liquorice. Unfortunately that floral side returns in full force at the death. Fairly simply but quite accessible Laddie. Light nose of peat, meat, peach. Peaty mouth, slight woody bitterness, sugar. Oily and punchy, complex. Long and good. A friend of mines wife said it tastes like 'licking batteries'. She is actually kind of right but in a good way. Citrus, sweet, some tannins. Malty, but slightly bitter. The tannins reassert themselves and there's a long bitter-sweet finish. 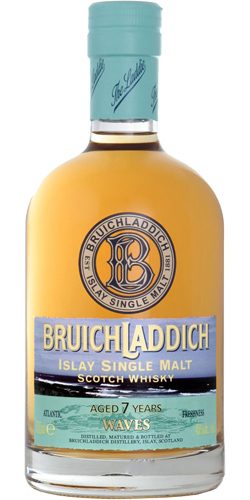 Little fruity with light peaty smoke, sea notes and sweetness. Sweet sherry notes and dried fruits. A lot of sweet smoke, fruits, sherry sweetness, relatively intensive in taste, creamy and warming. Medium long, sweet with wine notes, unfortunately not very complex. Nice dram, not realy complex, but a must for Retsina lovers or as digistif after a good Greek dish. Fruity, feint and peaty. First rubbery notes dominate (durex) and some green barley (or the smoky unripe dried spelt), also papaya and tropical fruits. Slight martini bitterness. Gets more winey and spicy. Striking saltiness, peper and myrtaceae herbs (eucalyptus). Greek wine (Retsina) and slight bitterness, but not unpleasant. Medium long on slight peat smoke and sweet notes of wine.